"This is a delicious side dish to add to about anything." Pour the macaroni into a saucepan and place over medium heat; stir in the butter, bacon grease, tomato sauce, stewed tomatoes with juice, and sugar; season with salt and pepper. Stir while cooking until butter and bacon grease has melted and incorporated completely, 5 to 10 minutes; remove from heat, cover, and allow to sit about 20 minutes before serving. this recipe is my hubbys favorite...I did use 2 cans of rotel tomatoes instead of stewed tomatoes to add that extra kick!! Very good and very easy. I save all my bacon grease and I was looking for a nice easy recipe to use some of it up - - this was perfect and easy. 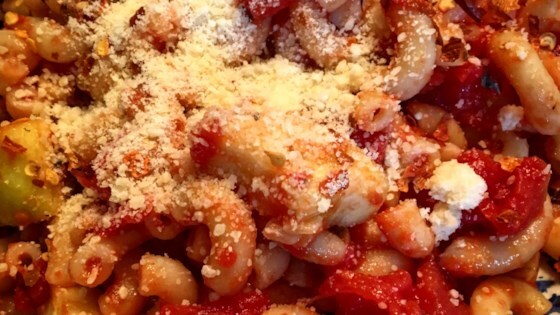 Topped with Parm. cheese.